← Did the Easter Bunny visit? Breakfast is the one meal of the day that people changing over to a low-carb, grain-free lifestyle struggle with the most. The good news is that there are many breakfast options that you can “primalise”. Breakfast doesn’t always have to be eggs – although eggs are your BEST choice and CAN be eaten every day. You can still enjoy muffins, toast and muesli in moderation. You don’t have to give them up. You just need to make the low-carb, grain-free versions yourself. So I encourage you to put that apron on and get into the kitchen and have some fun. Keep reading for the recipe for the winter porridge. I admit that it was hard at first to fit all this extra baking and cooking into my day. But now I get such satisfaction knowing that everything my family is eating at home is real, nourishing food, devoid of gluten, sugar, preservatives, chemicals, vegetable oils , soya and other nasty ingredients. That seriously motivates me ……. and my reward is seeing them thrive. When excellent health becomes your top priority, its amazing how one finds the time. So in the interests of helping you and your family get on the “Banting Bandwagon”, I thought I would share a lovely recipe for warm LCHF porridge. Put dry ingredients in a blender and blend until finely ground. Add boiling water and coconut oil to blender and blend until porridge is smooth. 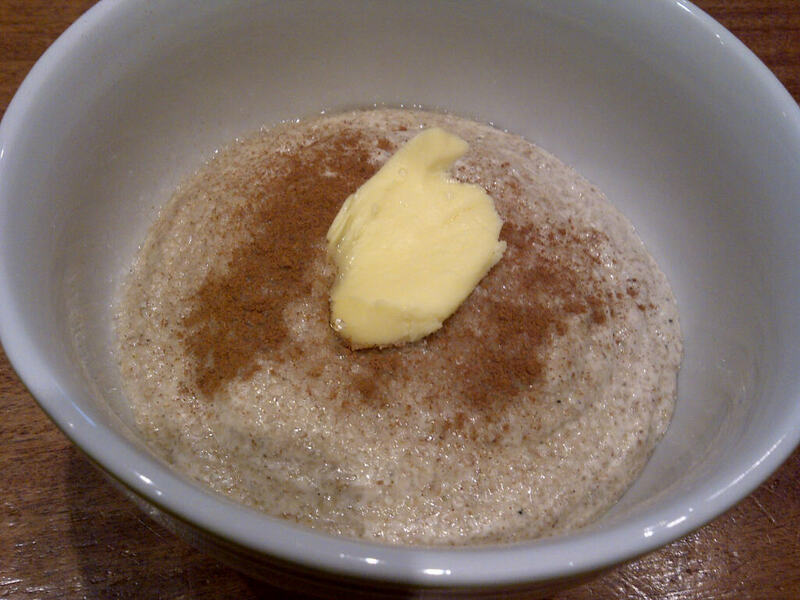 Pour porridge into a bowl and garnish with a knob of butter and a sprinkling of ground cinnamon and xylitol. Hint: Measure out all the dry ingredients and place in the blender the night before. Prepare the other ingredients so that they are “ready to go”. This will then be a very quick, warm and satisfying breakfast that will get you to work/school on time. Click the link for a PDF printer-friendly version of the Warm porridge recipe. The porridge recipe was inspired and adapted from Elana’s Pantry blog. Posted on April 26, 2014, in Meal inspiration, Primal 101 and tagged Banting porridge, LCHF porridge, Paleo porridge, Primal porridge. Bookmark the permalink. 14 Comments. I’m going to try it because I miss the cereals I have been eating for breakfast for the last 40 yrs. Hi Jenni, sorry the recipe didn’t work out for you. I make them quite often. Because it is a mixture of almond and coconut flour, the coconut flour seems to “grow” much more than when you just use almond flour. The other recipe on my blog for almond flour banana bread/muffins uses just almond flour (which can get expensive). Thats why I prefer the mix as it is a little more cost effective. I do agree that it doesn’t make very large muffins. I will play with the recipe and see how I can improve it. Thanks for the feedback. Hi Nicky, thanks for the response and I certainly agree with you about the cost effectiveness. I had enough batter for 14+1/2 muffins, maybe I should use a larger paper cup, if such exist, maybe I need to cook them for longer? They collapsed in the middle like craters! Very tasty though! I will still use them, soaked in warm milk as a breakfast while awaiting further feedback from you. Maybe next time I will try and use baking powder instead of bicarb and then also increase the quantity of flour and liquid to add more bulk? Hi Nicky….I have made your very successful Almond flour Banana Muffins which was a hit. So to-day I tried the Primal Banana flapjacks – which sadly didn’t work out so well. I’ve a feeling that the label might be incorrect as the quantity of flour was 1.5 cups to only 1 egg and 250ml of milk. I made the mistake of using coconut flour instead of almond flour but i don;t think that would make such a difference. I tried adding loads more milk and even added 2 more eggs to try to get to a flapjack consistency. No luck. I eventually put them into muffin pans and they came out like “rockcakes”. which are very edible and wont be wasted. Please could you check out the recipe and let us know. Many thanks for your wonderful insight and blogs. Hi Margie, coconut flour is a very “thirsty” flour and cannot be substitued in the same quantity. It would have made a huge difference to the recipe if you used coconut instead of almond flour. With coconut flour you need to use much less and add more liquid and eggs to make it work. I hope they come out better next time. Thanks for the feedback. I love it when people comment and let me know about what they are trying. Hi, I am all new to this diet! I am struggling!!! I had my gallbladder removed about 4 years ago and after every meal i am in agony ! A lot of pain under my right breast where my ribs come together and would spread further to the left ! Please could you give me some advise I am really serious and want to loose weight! Did the pain only start after you starting eating more healthy fat? Perhaps you need to start taking digestive enzyme containing lipase before each meal. I also had my gall bladder out 6 years ago but have not had any further pain subsequently. I will try and get to that but not sure when. I suggest that you input the recipe into MyFitnessPal and it will give you the values you need if it is urgent. My blog is a hobby so I need to manage my time on it. Sorry. So I followed this porridge recipe to the letter and all I got was soup. Pity as the picture looks promising. So sorry to hear it ended up like soup. I am not sure what could have gone wrong. If you attempt it again try using less liquid. It is such a delicious porridge that I make often. Possibly worth another try?